This is a citywide map, which outlines the City and Aldermanic District boundaries. At the time that the candidate picks up the nomination packet, the candidate receives a copy of the relevant map. If the candidate is seeking Aldermanic office, he or she receives a copy of one Aldermanic District. 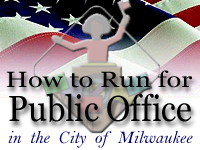 This Web site was created to assist citizens who are considering a bid for elected office. This cursory review does not replace the candidate's responsibility to review Chapters 5-12 of the State Statues governing the election process.